My recent trip to Bangkok, was quite long, so I decided to try the, much hyped, Siam Niramit Show. Its one of the most famous stage shows in the world. I took the sukhumvit line metro train and got off at the Thailand cultural center station. A free shuttle bus with siam niramit written on it, was waiting there. This van leaves every 15 minutes, from the metro station. I took a seat and waited, no one else joined so I was the only one in the shuttle transported to the siam niramit show center. Many girls in traditional thai dresses, with roses in hands, were welcoming visitors. They guided me very politely to the ticket center. I must say I was impressed by their sincerity and hospitality. 1500 baht/ head was the ticket price without dinner. I used a special promotional voucher, from my hotel (Royal President Group Hotels) and got a 20% discount. Quite a saving, i would say. They however wanted to see my hotel room-key, as the proof. I was not interested in the dinner they serve, as I had read mixed reviews about it from other travelers. (though some said the buffet @ 300 baht, was not bad). I told those girls that I don’t want to eat there, they did not mind at all, and even suggested some options near by, and also arranged the shuttle van to take me to the shopping plaza. I am sure you are thinking that this is exceptional hospitality, it definitely was. I felt quite good. I took the van a second time and arrived in time for the show. The show started at 8pm, and continued without a break till 9.30pm. I found that the VIP seats (They call Golden Seats) were not much better than the normal ones, so I felt I made a correct decision not buying a 2000 baht ticket. The Hall is quite big and can seat 2000 people, more than 50% seats were empty. After the red shirts riots the number of tourists coming to Bangkok has declined sharply and that was the reason for the hall being half empty. The show itself consisted of three parts. 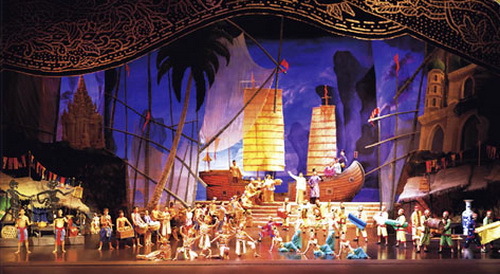 The first part showed historical scenes of different parts of Siam (Thailand’s old name). It was quite interesting, specially if you have some interest in the history of that region. My interest had grown a lot after watching the famous movie “Anna and The King”. Chow Yun Fat, played King Rama 4, and really did put an impressive performance. If you want to understand the love and respect that the monarchy enjoys among Thai people, this movie is the starting point. In fact I have not seen this kind of reverence for a King any where else in the world. Before the actual show started, royal anthem was played which ended showing the pledge of the King. “I pledge that I will reign with righteousness for the benefits and happiness of the people of Siam”. Short but so vast in its meaning. Thai people will tell you, that his majesty king Rama 9, has not only lived but surpassed his pledge. Long Live the King. In a touristy place like Bangkok, Siam Niramit really demonstrate thai culture. The shows are not only informative but interesting too. There are no to very few dialogues, so foreigners can enjoy the whole show with complete understanding. Stage was one of the biggest that I have ever seen, and production impeccable. The music was good too and some tourists purchased the audio CD after the show. Apart from men and women the cast included goats, hens and elephants too, and I shall say, they played their roles perfectly well. Direction has been perfected , during one scene a man dives in to the river, amazing sets. The second act showed heaven and hell. Although heaven did not have much effect on me, but the hell was really well portrayed, and I was surprised that they had shown drinking alcohol as a sin and people getting punished for it. I am not very familiar with Buddhism rules anyway. After the show ended, I came out of the hall and took a walk in the model village they have built for demonstration. As it was not crowdy, I felt like really walking in a village, felt very nice. 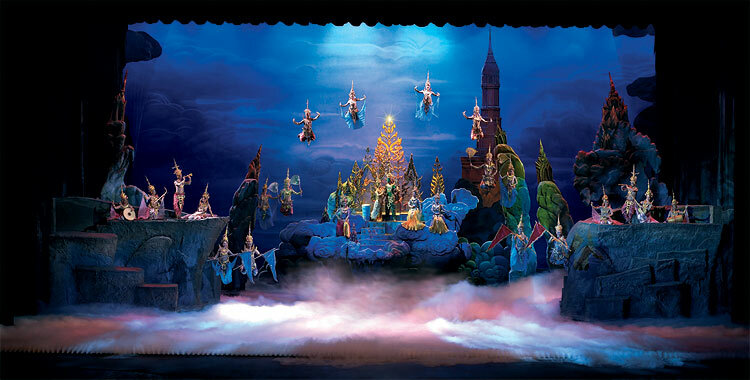 I would recommend visiting Siam Niramit, if you are staying in Bangkok for more than three or four days (or if you are really a fan of stage shows). Better not to take cameras with you, as they will scan you and put the cameras in a locker, which you can later collect after the show. Mobile phones were permitted though. One more tip would be to buy the tickets from some travel agent in the city, and you can get it much cheaper, I got the price 1200 from the one I checked. I did not bother as I had the hotel voucher anyway. This entry was posted in Bangkok, Uncategorized and tagged anna and the king, bangkok travel review, chow yun fat, culture, rama 9, royal president, siam, siam niramit, suhail nasir, sukhumvit, thai, travel tips.. Bookmark the permalink. Shortly, the journey was fascinating. KT I wonder why would you read this guide after seeing the show? or did u read it before seeing the show? process will end up being much less frustrating and, for the majority of people, enjoyable. thyroid hormones and also in sugar levels in the body. Many people don’t have the time to weight themselves every day, but checking the scale on a regular basis can definitely help when you’re working to lose weight and keep it off.